In the previous article we started studying two particular cases among altered modes. Remember that altered modes are those built from a scale that is not major. 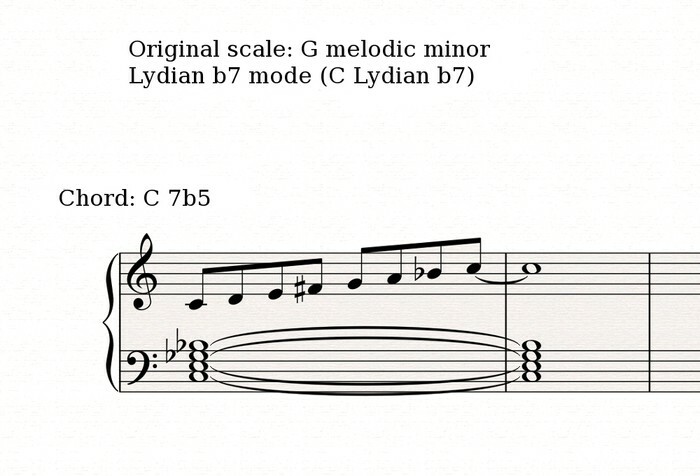 The two cases in question are the altered scale and the Bartok scale. After having explored the first one in the previous installment, today we'll study the second one. 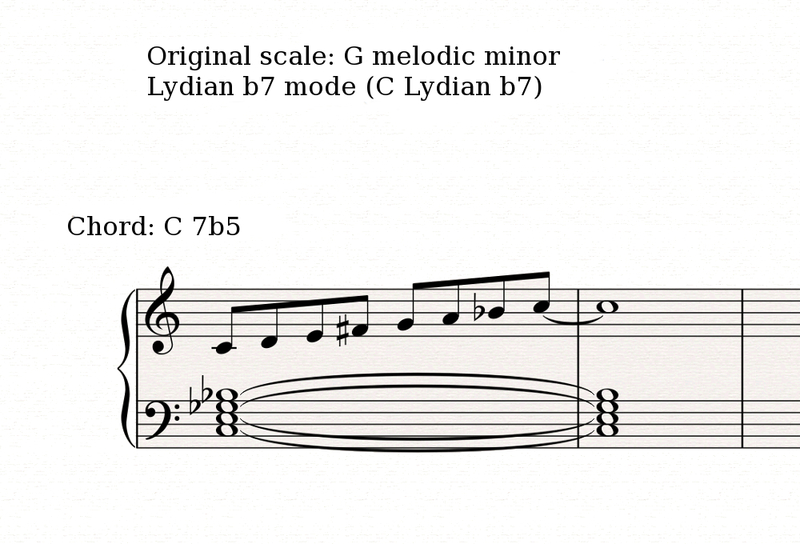 The "Bartok scale" is in fact the fourth mode from the melodic minor scale, or the Lydian b7 mode. 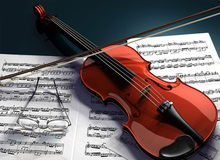 It get its name from Hungarian composer Béla Bartók who popularized its use at the beginning of the 20th century. 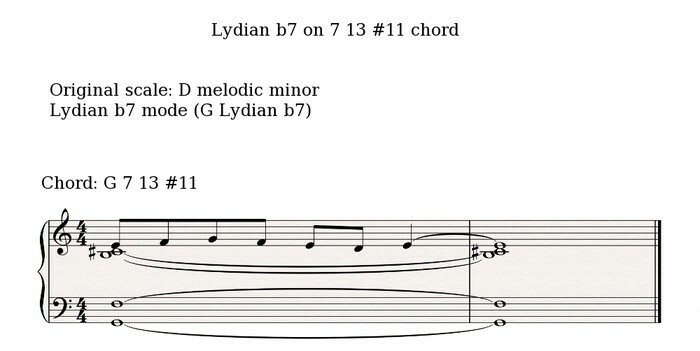 Due to the tritone formed between the major third and minor seventh, it is also known as the "Lydian dominant mode," in reference to the natural Mixolydian mode (see article 51). The latter is also characterized by the tritone between its major third and minor seventh, which is in turn linked to the dominant chord of the original scale in the tonal system. As you've seen throughout this series, our Western ears are used to the famous tonal system and the resolution of tensions created, especially the tritone. Consequently, within the framework of the Bartok scale, the progression of the three last degrees of this mode seems to ask for a traditional resolution with the perfect cadence. 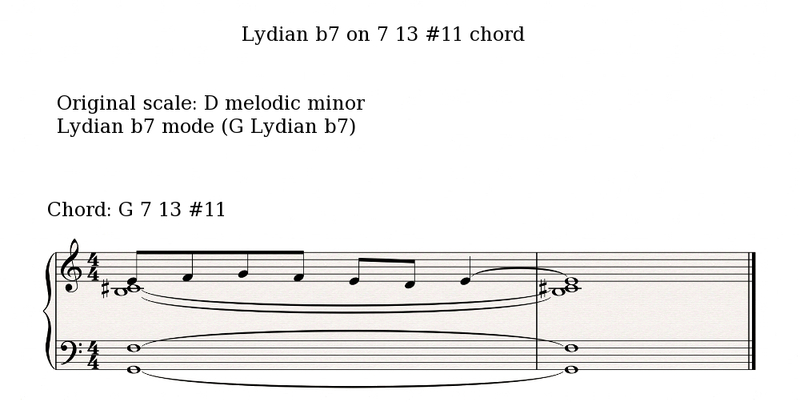 Hence, in the following example everybody expects an F after the last C.
However, the comparison between the Lydian b7 mode and the natural Mixolydian mode stops right there. In fact, contrary to the latter, the Bartok scale is completely incapable of resolving the tension eventually created by the tritone. And there is a very simple reason for that: it doesn't include the resolution note! The resolution note is a non-chord tone of the mode. Thus, in the previous example, the F expected after getting to the top of the progression doesn't exist in this mode. Unlike what happens in the natural Mixolydian mode, which does include the resolution note and can easily create a perfect cadence. Finally, the Bartok scale is also particularly interesting because the notes that make it up are the first seven natural overtones of the mode's tonic, once you get rid of the "duplicates" from the overtone list. For the sake of clarity, I invite you to revisit the overtone list in article 23 and compare it to the Bartok scale in the previous example. By the way, in this example, as well as in the first example of this article, the chord is a b5 (G flat) and not a #11 (F#). So you could say that the context is tempered, which allows you to use the F# of C Lydian 7.